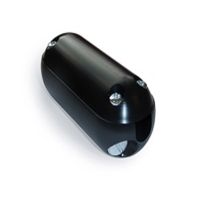 This rugged, compact Clamp Sonde is ideal to trace the location of drain cameras and drain rodes. It acts like a standard sonde emiting a 33kHz signal which can be picked up by a standard cable locator. The Clamp Sonde is easy to attach and transferrable between cameras. You can locate and determine the depth of your sewer or pipe inspection camera. When attached to a camera system and inserted into a drain, sewer or pipe, the signal transmitted from the Clamp Sonde can be located using any standard cable locator. This is useful in locating blockages and obstructions in nonmetallic pipes. Once attached to the camera cable, rod or similar, the Clamp Sonde with travel along the utility under investigation. Using an EZiCAT cable locator to locate it on the surface, you can trace the path of the camera or drain rod. Commonly drain cameras with integrated sondes can not use the camera and sonde simultaneously due to interference. With the Clamp Sonde attached, the camera can be utilised at the same time. 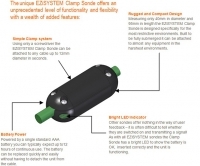 The depth range of the Clamp Sonde is up to 3 metres.